From buying a new laptop to hiring a home repair contractor, our choices in the modern world are seemingly endless. How can you gather the data you need to make an informed decision? Which data should you trust? It reminded me of playing with my Magic 8 ball as a kid – you know you hold all of the answers in the palm of your hand, but have no clue what question to ask first! This client’s team was so overwhelmed by their data and the many different ways it was stored and collected, that they couldn’t fathom what question to ask, where they should begin, or how a deep dive into the data would benefit them specifically. After consulting with team leaders from the various departments at this company, the problem revealed itself like a Magic 8 ball answer floating in the murky ink: it wasn’t obvious which department’s analytics quest would cost the least but bring in the greatest amount of revenue. Everyone had data, but which data would solve the company’s biggest problem? And what, precisely, was that problem anyway? In order to use Predictive Analytics to make better marketing and business decisions, you first have to come to a consensus as to your company’s most pressing problem. Once you’ve determined which problem needs to be solved first, second, and so on, you can identify which sets of data should be used to solve those problems. Identifying a specific problem is just like knowing which question to ask. But asking the Magic 8 ball your question and shaking up “signs point to yes” isn’t enough to solve your issue long-term. In addition to asking the right question and using that question to dig into a specific problem, you must know how you are going to use the answer. If the insights gained from digging deep into the data don’t result in organizational and behavioral changes within the company, then a data-driven project becomes an exercise in futility (or, in Magic 8 ball-ese, “outlook not so good.”). 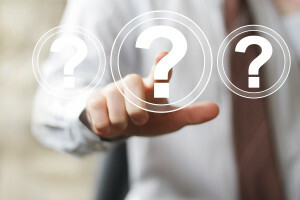 In order to help our prospective client find the right question to ask so they could make better data-based decisions in their organization, we created a list of questions for the data stakeholders in each department. We then used their answers to frame the discussion during a meeting with all department heads, helping them determine which perceived needs were redundant, which were natural predecessors of others, and which should take priority in our data deep-dive. Because of this process, the client not only realized which question to ask – they discovered which question to ask first, which problem to tackle first, and (most importantly), what they were going to do once they found the answer. They also discovered deficiencies in their data storage and collection processes, another added benefit of completing an analytics project. From “outlook good” to “ask again later,” the answers are in the data. By identifying the question that needs to be asked first, you can pinpoint the problem that needs solving above all others, and find the answer that will lead you to increased revenue, reduced marketing spend, and better data collection processes. When you think of salad, do you immediately think of pork, brown sugar, and roasted fennel? I bet not! And yet when I think of salad, my thoughts immediately turn to this standby made whenever I entertain guests in my home. This breakout recipe reminds me of using data to determine your company’s most pressing problem. Just as we all have different ideas about what makes a great salad, each department head in your company may have a different idea about what question to ask or which problem to tackle first in your data-driven project. Only by taking a close look at the data each department has can you determine where to begin, which question to ask, and which problem to solve (and which salad to try!). If you’re not sure where to begin with your data or your diet, may I suggest roasting fennel and pancetta with brown sugar? Toss with romaine or arugula for an extra flavor burst – I love the peppery contrast of arugula to the sweet roasted pancetta. Take the next step and learn which question to ask for your organization? See how Massa & Company can help you ask the right questions and find the answer in your data. Find out more by calling (312) 463-1050 or contacting us online.